Yesterday evening I ventured to 5th Avenue and 21st Street in Brooklyn and participated in what was a neighborhood party for Bill de Blasio, who has just won the Democratic Nomination for Mayor. He described the area as "his neighborhood". It was an opportunity for de Blasio to thank 100 of his neighbors who helped push him to a strong (no-runoff) victory in the Democratic Primary. He urged them not to let up for the next six weeks to the general election. He apologized first for being two hours late. He said he had a really good excuse–he was meeting with the Commander in Chief, Barack Obama. 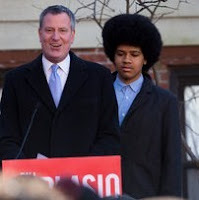 The President was introduced to Dante de Blasio, and was described as walking around Dante staring at his Afro, commenting on its size and contrasting it with his own lopsided Afro of many years ago. Here is someone who doesn't wait for other people to do things for him. When he sees a problem, he gets up and does something about it. That is leadership. He mentioned that the first two polls matching himself against Lhota have given him a three-to-one majority, but he urged those present "not to rest on our laurels". He picked up on income and wealth inequality with the "tale of two cities" theme and was eloquent on the struggles that working people have to "make ends meet" in an economy where real earnings have been declining. He portrayed Mayor Bloomberg as not being able to empathize with the working poor and the middle class families living at the margin because their life is so far removed from his own. November 24, 2013. Photo by JTMarlin. New York City has been blessed with a succession of strong mayors, and now we have two strong candidates for mayor - the "second-toughest job in America," as the late Mayor Koch used to say. Mayor Bloomberg will be a hard act to follow. Coming in right after 9-11, he was a godsend and must be considered one of the great mayors of the city. Having a mogul as Mayor was a signal that the city is likely to be safe for other moguls, and gave them confidence to stay, to visit and move in. The steady aggregation of wealth in Manhattan keeps the NYC brand strong, even if Wall Street's rep is in the gutter. NYC is still the safest big city. The NYPD's "stop and frisk" hunts for illegal weapons or other contraband have been deemed unconstitutional by a Federal judge because they have had insufficient cause. Race is not enough of a reason to stop someone. The judge says a cop has to have a reason for stopping someone. That doesn't mean crime rates are going to have to soar again. The labor unions are chomping - no, foaming - at the bit for long-delayed collectively bargained contracts. The new agreements could be budget-busters. Depends on how the revenues come in and the U.S. economy is still recovering from 2008-09. The people Mayor Bloomberg chose to turn the school system around, and the methods they are using (such as constant testing) have been strongly criticized. Needs some re-thinking. His economic development programs have been heavily real-estate-oriented and involve unprecedented levels of new property-tax abatements that will pinch the budget as more services are required for new areas of development. The late-in-the-game tech initiative, a Cornell campus on Roosevelt Island, may disappoint for the very reason that was its impetus - the City's interest in making use of property on Roosevelt Island. The Mayor's ability to fund his own election campaigns has meant that he is not forced like other politicians to hunt for contributions - which has kept him above interest-group pressure, great, but also has kept him detached from the hoi polloi. 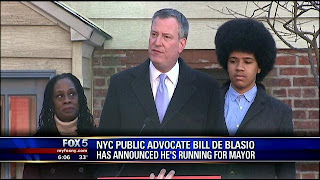 Both Bill de Blasio and Joe Lhota are capable of running New York City. The major differences between them are ones of personality and policy. Personally, de Blasio is warm, enthusiastic, and neighborly, whereas Joe Lhota is tense, combative, and remote (when he is under stress, his eyelids come together as if he seems to want to shut out all the rest of the world). On the policy front, de Blasio wants to level the playing field for NYC's middle class and poor people, which means more services for them and probably higher taxes on the very well off. Lhota's biggest concern is to avoid raising taxes at the top rates and to keep NYC safe for wealthy apartment buyers. They both will be tempted to put these differences under the light of class warfare. Lhota may think he will win most this way, but I wouldn't bet on it. Not this year. The unions may have been divided in the primary, but most of them seem to have no trouble scrambling from the Quinn and Thompson camps to de Blasio. 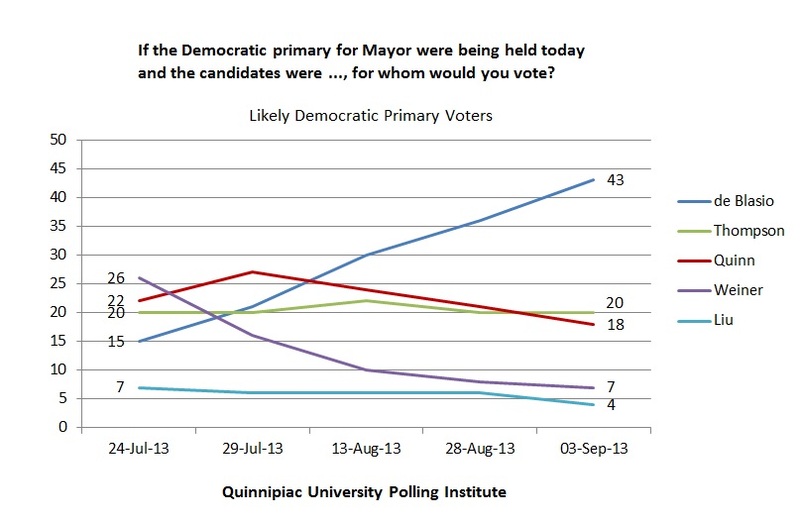 The first two polls show de Blasio ahead by a three-to-one margin. 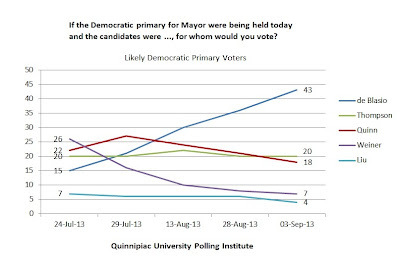 (These numbers are virtually the same as those for Quinn vs. Lhota way back in 2012 when de Blasio was an unknown.) The first tests for the next mayor will be whether he can work out labor agreements that don't break the budget. The good news for the next mayor, whether de Blasio or Lhota, is that New Yorkers are weary of their mogul. Twelve straight years of Bloomberg after eight years of Giuliani means that City Hall has gradually been cut off from the public, for reasons of security and of philosophy, in ways that were inconceivable in the Koch and Dinkins days. To bridge the gap between income and wealth inequality described as "the two cities", de Blasio has made a specific proposal to get a little more money from the rich (raising the top tax rate slightly, by a fraction of a percentage point, on those earning more than $500,000 a year) to provide expanded access to early-childhood education for everyone. Offering earlier schooling means the working parent or parents can go back to work earlier, while the children are socialized earlier and are likely collectively to perform better in higher grades. NYC businesses will reap the benefit of a more skilled workforce. Lhota has accepted half the idea, the universal pre-school part, rejecting the idea that higher taxes would be needed. In the less than six weeks between now and the election, the two campaigns and the many "independent" voices will be painting the choices in various colors of class warfare. Lhota has already said that de Blasio is using a "Marxist Playbook". The realistic range of policy options in New York City does not take us into the terra incognita of "There be Dragons" Marxism. But the City does face real choices. Bureau of Economic Analysis map out today shows healthy real-GDP growth in metro areas in 2012. The average of all U.S. metros was 2.5 percent. Urban economists, politicians and economic consultants watch regional data closely for competitive reasons. Growth rates provide clues as to the success or failure of regional economic and tax policies. Metro growth was especially strong (dark and light blue) in in Texas, the Midwest and Northwest, and was weak (brown and beige) in much of upstate New York and New England, Southwest and western Florida. Growth in the NYC area, which includes Long Island and Northern New Jersey, is middle of the road, about 2 percent. The map shows the uneven nature of economic growth in the United States. Decline and growth may be close neighbors. California was mixed. Also Florida - some parts, notably Greater Miami, grew rapidly while other metro areas in the state's northwest declined, while mid-Florida grew moderately. GDP data are a better measure of a local economy than job numbers (unemployment, payroll job growth), but they take much longer to see the light of day. Job numbers for large metro areas are published by the Bureau of Labor Statistics within a month after they are collected. The good news this year is that the BEA is back to getting out the metro GDP data within nine months after the end of the year for which they are reporting. They had slipped to taking more than 12 months. Data delayed are data denied. For the whole story and a high-resolution map, go to the release on the BEA website. At our brunch in support of Congresswoman Carolyn Maloney yesterday, there was many questions about Syria. One question was whether and when the United States signed the Chemical Weapons Convention. The United States signed the Convention on January 13, 1993, seven days before the end of President George H. W. Bush's term. It came into force the first year of President Clinton's second term. The UK and USA memberships in the Organization for the Prohibition of Chemical Weapons came into effect the same day, April 29, 1997. They are listed by number on the OPCW website; these numbers do not reflect the order of signature. The Organization for the Prohibition of Chemical Weapons is NOT a United Nations Agency, but operates as an independent organization in the Hague, the Netherlands. It has 189 member countries, at last count on the OPCW website. Syria is NOT one of the members. Tepper Marlin as Rep. Tim Bishop looks on. Sept. 8, 2013–A vote on military action was taken at a fundraiser that my wife Alice and I supported for Rep. Carolyn Maloney yesterday on the East End of Long Island, NY, hosted by Rep. Tim Bishop. The Q&A was extraordinary. Sharp questions, good answers. The voters of NY1 and NY12 are well represented. Neither Bishop nor Maloney is listed as of September 6 (Friday) in the Think Progress tabulation as leaning either for or against action in Syria. In the House of Representatives, 39 expect to vote yes to Syrian action, 223 probably no. Polls show that most Americans oppose U.S. action in Syria. This is reflected in the mail for Rep. Bishop. 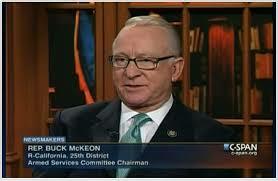 He says that 95 percent of his constituents' messages are against a strike in Syria. Rep. Maloney asked for a show of hands for support of a strike at Syria for use of chemical weapons. Only three people put their hands up, and 40-50 hands went up by people opposed. Last year I worked for six months in Newark, NJ as Chief Economist for the New Jersey Institute for Social Justice, which is headed by attorney Cornell William Brooks, who used to work in Washington for the Department of Justice. One of the projects of the NJISJ that I spent some time on was preparing background data to examine the potential impact of a proposed New Jersey law nicknamed "Ban the Box". This is a bill to prevent job applicants from being given no chance of competing on their qualifications because of the inclusion of a box on employment applications that asks about arrests or convictions. In practice, checking this box can mean that applicants are disqualified immediately from further consideration. convictions for offenses like possession of small amounts of marijuana that would today likely be dismissed. For the City of Newark, it is an economic issue, because the high unemployment rate in parts of the city means that many youths have a choice between no work and work that borders on, or crosses over, to illegality. The economic health of the city depends on finding work for people who have an arrest or conviction record that is a barrier to employment. "Ban the Box" is an attempt to break this vicious circle. 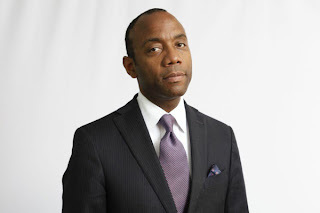 The NJISJ President and CEO, Cornell William Brooks, has written a fine article on the "Ban the Box" issue that appeared today in the NJSpotlight, a newsletter targeted at the nonprofit community in New Jersey. With Cornell's permission, I have appended his article, in full, unedited except in three paragraphs that I have put in bold face because they lay out economic aspects of the problem. One of today’s major economic challenges to the nation and New Jersey is best described not with new data but with two long-forgotten black-and-white photos. 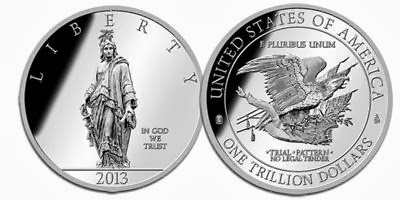 The first depicts a young man with a precocious maturity and the number 7-0-8-9 scratched over his undeniable dignity. The second shows a somewhat older woman whose face reveals both shyness and fierce determination. Yet the number 7-0-5-3 is scrawled like the grime of graffiti across her unrepentant personhood. The slender young man came to be known not by the arrest number 7-0-8-9 but rather by his formal name: the Reverend Doctor Martin Luther King Jr. Similarly, the reserved older woman is not known to the world’s schoolchildren as number 7-0-5-3, but rather as the mother of the modern civil rights movement: Mrs. Rosa Louis Parks. The 1956 mug shots and criminal records of civil disobedience for Dr. King and Mrs. Parks were found in a file cabinet in 2004 -- forgotten for nearly a half century. Were those records created today, they could neither be lost nor forgotten. The 65 million Americans (one in four adults) with a criminal record are reminded whenever they fill out a job application that states: “Please check the box, if you have ever been arrested or convicted of a crime.” This tiny box is a massive economic challenge to both job applicants and business. The misuse of criminal records by some employers is not only an economic challenge but also a moral challenge. Business leaders, advocates, and legislators are addressing both with the proposed New Jersey Opportunity to Compete Act, sponsored by Sen. Sandra Bolden Cunningham and Assemblywoman Bonnie Watson Coleman. The economic challenge starts with today's ubiquitous digital technology. Anyone’s criminal record is accessible to anyone anywhere in the world with the click of a mouse or the swipe of a finger across a screen. These Internet records, no matter how old or inaccurate, have digital eternal life. For employers protecting business reputations, workplace safety, and staff quality, criminal record access is critical. Once a person with a record checks the box, the employment process often ends immediately -- regardless of what the record actually says. A box-checked application is often trashed unread. Employers who blindly screen out applicants by the box hurt both business and applicants. The majority of people with criminal records have neither spent time in prison nor committed a felony or violent crime. Many are not guilty of any crime at all. Most have been arrested, but not convicted. Moreover, of those convicted, most have only been convicted of nonviolent and often minor crimes. According to Princeton sociologist Devah Pager, having a criminal record decreases the likelihood of a white male job applicant getting called back for an interview by at least 50 percent. For black men, the rate is even 40 percent worse than for white men. A man with a record of incarceration will lose $100,000 of income in his prime earning years. Not surprisingly, people formerly incarcerated lower the national employment rate as much as 0.9 of a percentage point; male employment, as much as 1.7 percentage points; and those of less-educated men as much as 6.9 percentage points. This joblessness costs at least $57 billion nationally and annually. With 65 million Americans with a record, 2.4 million incarcerated nationally and 41,000 statewide, everyone knows someone with a record -- from the studious Rutgers undergrad with a high school shoplifting conviction, to the respected middle manager guilty of a nearly forgotten sorority prank, to countless scores of ambitious young men arrested but never convicted under “stop and frisk” policing run amok in our cities. The box is also a moral challenge. Harvard sociologist William Julius Wilson has long written empirically, eloquently, and sadly about what happens to poor communities when their citizens aren’t able to work. Joblessness frustrates not only the ability and ambition to hold a job but also the ability and perhaps the aspiration to raise a family responsibly. Imagine the possible moral consequences of employer policies that impede the ability of literally millions of people to compete fairly for work. Many employers, employees, and parents believe that work is not merely economic activity but a moral exercise. Work and even the ability to compete for work can imbue the young with discipline, ambition, an aversion to crime, and the aspiration to start a family responsibly. Using the box to unfairly screen out qualified applicants, with minor convictions or mere arrests, not only affects them getting jobs, but also building character, forming families, and contributing to the community. For example, a child who sees a parent working -- or even competing for work–gets a moral lesson in responsibility. After meeting with the business community for nearly a year, Sen. Cunningham introduced the New Jersey Opportunity to Compete Act. The legislation would move the box off the application and postpone (but not eliminate) a criminal background inquiry. This is precisely the same practical policy of America’s largest private employer, Wal-Mart, and the nation’s largest public employer, the federal government. This policy would allow job applicants first to be considered and compete on their qualifications -- then be asked about and assessed on any criminal record. Should this legislation pass, New Jersey would join over 50 jurisdictions and 10 states with similar laws. With the bill’s introduction and a dozen pro-business compromises, this bill is now poised to become America’s most business-sensitive and community-responsive law of its kind. New Jerseyians extol the values of competition and fair play on the sports field. We need to do as much in the job market–particularly for those who only want a shot at a job. Over the last couple of years the President has surged the troops in Afghanistan while he cut the military budget. He flew missions over Libya while he cut the military’s budget. He changed the strategy to focus on the Pacific, while he cut the military budget. 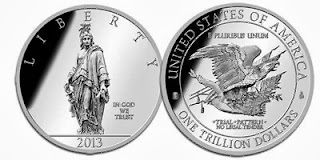 Our military has had over a trillion dollars cut over the last couple of years and going forward. The Chairman of the Joint Chiefs and the Chiefs that serve with him have not had any kind of certainty in how they plan and what they look forward to from year to year over the last couple of years. This Sequestration - the President needs to fix. This would be a great time to fix that. To show the military that while we are asking them to continue on with mission after mission after mission. Instead of cutting back, like [President Obama] told them the day before he announced this decision that they weren’t going to receive the pay next year that they have been planning on. Instead of doing that kind of thing to our military, we ought to look out for them just as we are looking out for those people in Syria. ... We cannot keep asking the military to perform mission after mission with sequestration and military cuts hanging over their heads. We have to take care of our own people first. ... The world has not gotten safer and yet we are cutting a trillion dollars out of our military- asking them to do more with less. 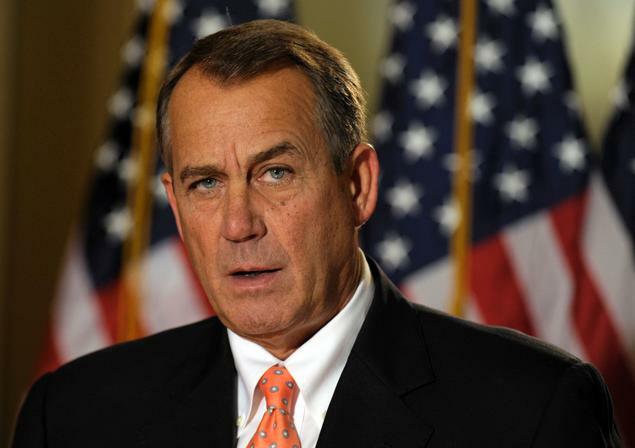 House Speaker John Boehner (R-Ohio) announced today (September 3) that he would support President Barack Obama's call for action in Syria, and urged his colleagues to do so as well. I'm going to support the president's call for action. I believe my colleagues should support this call for action. We have enemies around the world that need to understand that we're not going to tolerate this type of behavior. The Speaker offered his support for the president’s call to action, and encourages all Members of Congress to do the same. Now, it is the president’s responsibility to make his case to the American people and their elected representatives. House Majority Leader Eric Cantor (R-Ohio) said today (September 3) that he would support a resolution backing military action. House Minority Leader Nancy Pelosi also voiced support for military action in Syria. President Obama did not draw the red line. Humanity drew it decades ago. President Barack Obama said that he was confident that Congress would pass a resolution. So long as we are accomplishing what needs to be accomplished, which is to send a clear message to Assad, to degrade his capabilities to use chemical weapons, not just now but also in the future, as long as the authorization allows us to do that, I'm confident that we're going to be able to come up with something that hits that mark.